I live in the 600 block of North Milwaukee and was making my way down to the corner CVS pharmacy to purchase a bottle of champagne. On my way, I noticed that the Juicy Wine Bar had opened (apparently on Monday) in a portion of the space formerly occupied by Iggy's. Since I would much prefer to do business with a local retailer, I stopped in for a quick look around and ended up leaving with a bottle of Veuve Cliquot Rose. Juicy is not technically a restaurant, but more of what I might term a barsteraunt. They have table service upstairs and downstairs. I think a DJ comes in later in the evening to spin records upstairs. The only products served appear to be cheese, meats and wine. The cheese and meat list were quite appealing, with a few cured ham products, lomo and some good looking sausages. The cheese list was equally appealing. Prices for most items were $5 for tasting portions. As I was only purchasing a bottle of wine to go, I didn't spend that much time looking at the menu. The wine list was quite impressive. I consider myself something of a wine geek and if you couldn't find a bottle you liked there, you probably can't find one anyplace else either. The prices for drinking on premise were $15 per bottle more than the take away price. I would consider the take away price to be reasonable for a small retail operation. The extra $15 is just a corkage fee. I didn't spend enough time there to give a full report, but I did try some excellent sausage made from jamon iberico as I was on my way out. I intend to return within the next few days and hopefully provide much more detail. So Veuve Rose was comparable in price to, say, Binny's? The Veuve was $65 versus $54 at Binnys (which is always a price leader). If you chose to consume your bottle in the establishment, the cost was $80. There aren't nearly enough (any?) places in town with mark ups this low. It's not a price leader for take away, but I can't think of a place with more reasonable wine prices should you choose to drink there. Got you. $80 in the restaurant is indeed great. Thanks for the heads up! So has anyone eaten at Juicy? I'm very curious. I frequent the Matchbox, which is just down the street, and am always looking for someplace to get food afterwards. How is the food? How is the atmosphere? My boyfriend lives across the street, so we ducked in to Juicy Wine Company Thursday night to sample the wares. Rodney, the owner, has yet to open the upstairs, so we grabbed the last of about 8 tables in the downstairs dining area just beyond the counter. Rodney bounded up and asked what sort of wine we were looking for. After a long day of office holiday party shennanigans, we could barely get out the words "something light" before he was off and running. Rodney quickly returned with a bottle of Stadt Krems from Austria, which somehow was exactly what I needed. On to the food. The menu really just consists of ten cheese flights and several meat accompaniment options. Rodney clearly had some fun in describing each of the flights, but not in a way that crossed over into cutesy. I for one never knew that Humboldt Fog was a pot reference. 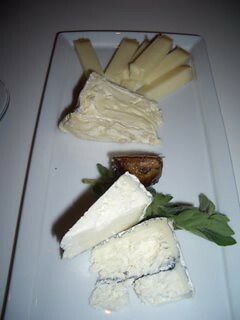 At his urging, we went with the American Artisanal cheeses: the aforementioned Humboldt Fog, a favorite of ours, along with a Roth Kase Surchoix Gruyere and Old Chatham's Nancy's Camembert. While I might not be the most knowledgeable person on the block, I do love cheese. The Gruyere was by far my favorite, with a barely discernable grit and all the pungency of the good European cheeses, but without the accompanying taste of feet. The camembert was also a hit, with a more layered, complex flavor than the average wedge you'd grab at the grocery store. In short--cheese, elevated. This was exactly the sort of experience I was seeking from Juicy. On to the aptly named "Mega Meat" menu item. The Prosciutto di Parma topped the list, but the Jamon Serranno and Salchichon Merico di Bellota were nothing to sneeze at. The Rillettes du Canard was a pleasing version of duck liver pate and the chicken liver mousse was a surprise hit, full of raisins and other unexpected flavors. It was truly not like anything else I have eaten. The one unappealing note was also the most gimmicky. Rodney serves up the meat platter with a flourish and then whips out his miniature blow torch to cook the bacon (speck Alto-Adige to be precise). The result was a greasy slip of meat that tasted like the fuel used to power the torch. Eh. But everything else was such a treat that it was easy to overlook. I'm eager to see the upstairs once it opens, but the downstairs had a properly lit, pleasing ambience, especially considering its close proximity to the cash register and a giant refrigerator filled with meat and cheese. The blonde wood wrapped around the walls is a bit reminiscent of Avec, but not nearly as stark. Our bottle of wine clocked in at $43, I believe, and our bill came out to about $75 with the cheese and meat orders. We opted for the smaller size of each, but it's nice to know there is a larger order option, especially since so many groups seemed to be filling the place already. I was also impressed by how few kinks Juicy seemed to have so soon after it opened. Between Rodney's sheer enthusiasm and the high quality of the offerings, I hope Juicy thrives. This week's Time Out Chicago features a giant picture of Juicy's "butter and salt" flight to open the "Eat Out" section. Doesn't seem to be on their website yet. Time Out Chicago wrote: No, this is not a joke: You really can order an entire plate of butter at Juicy Wine Co. ... we assure you that the butter and salt flight -- Tournevent goat-milk butter topped with red Hawaiian sea salt, Vermont Butter and Cheese Company's cultured butter with Black Cyprus sea salt and a Parmagiano-Reggiano butter form Emilia-Romagna topped with truffle salt -- is worth every penny. I guess Martha Bayne caught this on The Food Chain in December, but I hadn't heard about it. duh. i don't know HOW many times i've taken a pix of that butter flight but... the parmagiano butter is just the tastiest of the bunch; all 3 accompanied by bottomless red hen bread. we also found the lil bottle of bubbly nigori sake fun (and extremely pricey), tho doesn't go well with the butter flight at all. with above gravitas, i have no clue how Juicy did not win TOC's best new wine bar of '07. lame. now if "Sunshine" actually starts the sake bar he was talkin about, i'd be a patron there as well. The photo is nowhere near as impressive as when it fills a full page of the magazine, but it's online now. Mario, or his Pop Armandino? sundevilpeg wrote: Mario, or his Pop Armandino? Went to Juicy to conduct some business and try some meats, cheese and, most importantly, butter. The wines were well chosen, comparably priced to other wine bars (we got everything by the glass, but, as stated above their by-the-bottle prices are great especially for higher end bottles which are still only marked up $15 from their retail price). The white wine was served a little cold for my taste, but warmed up quickly in the almost cavelike atmosphere at Juicy. All three of the butters were great. The truffle salt tastes amazingly of truffles at first then disappears into saltiness (no lingering truffle taste). The small plates are enough for 4 - very generous. We got a small esoteric French and a small mega meat. No more blow torch with the speck...maybe they learned. 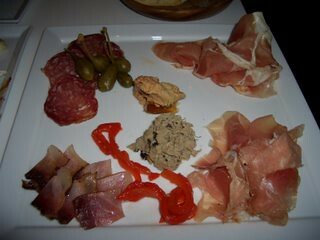 We also got a portion of the culatello, a cured beef that was melt-in-your-mouth. Everything was delish, but my tastebuds were on salt overload and the server refilled my water glass uncountable times. The retail side of Juicy is really outstanding. Usually, I drive my car into their outside patio at 45 mph on the way to someone's looking for a wine, any decent wine, that someone can recommend to me. The last time, (I was running late), I arrived at the wine shop breathless, "please bring me Spanish -- red -- not too heavy" and I was treated to a tasting. Excellent. And the wine went over well. That's service. Echoing Aschie, nice service by nice people. The upstairs terrace is a joy, especially when you have it all to yourselves. Add a plate of finocchiona with Red Hen bread, a Black and Blue panino - which comes with side mounds of olives, marcona almonds, honey, mustard, and raisins - and a half-glass of Grilos, and you're not even to $20 with tax and tip. Now, they're not cooking pibil overnight or anything, but for what they can whip up from their quality stock of ingredients, this is an impressive feat, and done with universally good humor.